DP-700A is light weight hand-held design dry wall sanding tool, high efficiency to work. Environmental friendly polishing machine with automatic vacuum system. 800W drywall sander with automatic vacuum system. with one LED light, more convenient to work in dark environment. Drywall sander with suction adjusting device, can be adjusted the capacity of suction easily. Handshake used soft anti-slip design. High quality device with light body weight. the 2nd handle could be setted in left side or in right side. 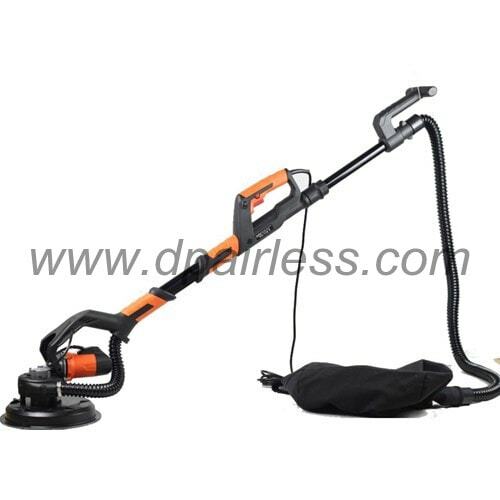 self vacuum drywall sander include the dust collecting bag, and dust hose. No need to connect it with vacuum cleaner.